Yes, a beloved bottle episode! The bottle episode has a long, noble history in television from sci-fi (the term originated with Star Trek's 'ship in a bottle' episodes) to sitcoms (Seinfeld's Chinese Restaurant, Community's Cooperative Calligraphy) to dramas. Traditionally used as a way to save money, characters are relegated to a single set and removed from the regular action in a stand-alone episode. With dramas, the bottle episode is less about saving money than serving to isolate certain characters and refocus the tension on their vulnerabilities. Often the episodes will air towards the middle-end of a season halting – for an hour – the momentum but in creating an intimate window into the main characters, the bottle episode actually heightens the tension for the rest of the season. We've seen the souls of the characters and now we watch desperately with baited breath as the season finale comes hurtling down the tracks. You can tell a drama is maturing when they have a bottle episode. Taking the time to withdraw from the action and stall the plot, especially as a season draws to a close is the mark of a disciplined story teller. Breaking Bad has had a few bottle episodes, most notably season three's phenomenal 'Fly'. Homeland had the exquisite 'Weekend' in season one. Mad Men stuck Don and Peggy with an overnight brainstorming session in season three's 'The Suitcase'. Each of these examples is arguably the strongest episodes of its series (making them really really really really good episodes as opposed to merely really really really really good). There is an element of theatre to the format since the tension is derived solely from dialogue and relationships, without outside elements forcing the plot. Walt and Jesse, Carrie and Brody, Don and Peggy might as well be acting out their own version of Who's Afraid of Virginia Woolf. Bottle episodes can refresh even the most tedious series (if only for one episode). AMC's disaster The Killing aired one and for that glorious hour I stopped hate-watching. That week the show was only about Linden and Holder not about ridiculous conspiracies, an infuriatingly endless parade of red-herrings and a bizarre pathos for Fair Isle sweaters. There was a palpable melancholy as the character – much like Walt, Carrie, Brody and Don – faced their limitations and saw the stark reality laid out before them. The Walking Dead has been crying out for an episode like this one for two seasons. In a show that is about surviving the collapse of society and where monsters lurk and death abounds, there has been a surprising lack of melancholy. There have been moments of sadness, dropped on the viewer with all the subtly of a flashing applause sign (LORI DIED. LORI WAS MOTHER. THE CHILDREN ARE MOTHERLESS. FEEL SAD : ((((( !!!) but those moments, heavy-handed or not, are sad because death is universally sad not because we care about the characters. The most haunting and powerful works of fiction work because the audience is shown rather than told. There was a novel published a number of years ago that was made up entirely of refrigerator notes between a mother and daughter. Side-stepping the banality of novelty premises, the punch line was that the mother got sick and died. And the reader got to see it all unfold over a bunch of notes. The message was clear, we do not spend enough time face-to-face. We need to cherish our loved ones because one day you're leaving a note asking them to pick up milk and the next you're writing to a damned ghost. I imagined Nicholas Sparks shaking his head sadly and, in a pleading whisper, calling for "nuance". TWD heard that plea and created a bottle episode that at last humanized characters without telling us what they were doing. With this week's bottle episode, TWD took a step back and gave the audience an hour with Michonne, Rick and Carl and allowed us to see them as people. We learned about their fears, losses and their humanity. 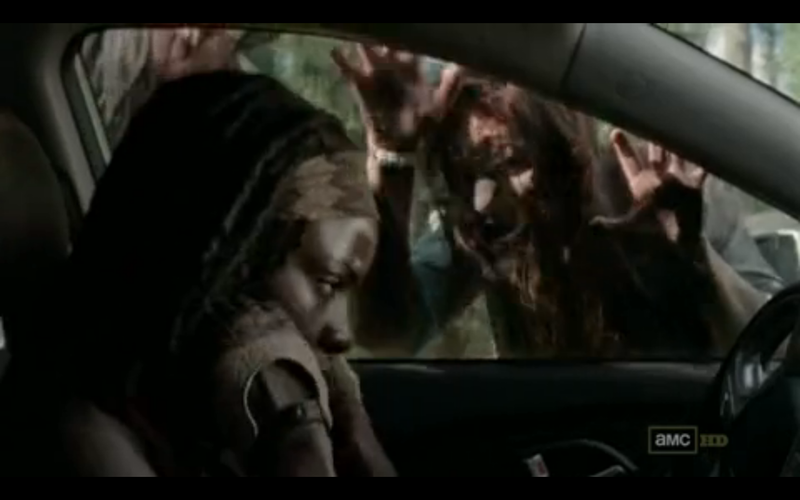 Before this episode Michonne had spoken ten lines and just done a whole lot of grimacing. Her motivations were muddled and her loyalties unclear. 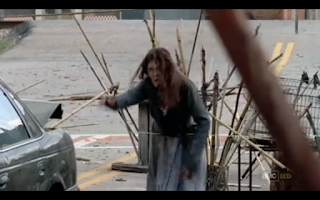 We knew she hated the Governor upon sight and that she resented Andrea for choosing him. Beyond that there was little beyond over-played strong Black woman tropes. With minimal telling and lots of showing, TWD brought Michonne to life. She is not the loner we thought she was based on her distrust of Woodbury. She is highly attuned to people's distress — her compassionate words to Rick about how she used to speak to her dead boyfriend and the way she helped get the picture for Carl took her from mercenary to human. She has a sense of humour (that stupid little cat) and a Patch Adams-like gift to make a sad, scared little boy laugh. Without supplicating, she gained Rick's respect and trust. Last season and the beginning of this season, Carl has been the little man sheriff, ignoring orders and displaying a disturbing nonchalance for shooting loved ones in the head. My worry has been that he had become a cold, callous person whose last remaining shred of humanity is dangling by a thread. It would be an interesting move on TWD's part to point to a future void of happiness and security and love by giving us a generation of hardened children who have killed their share of fetid walking corpses but even Cormac "dead baby tree" McCarthy couldn't pull the trigger on that one. 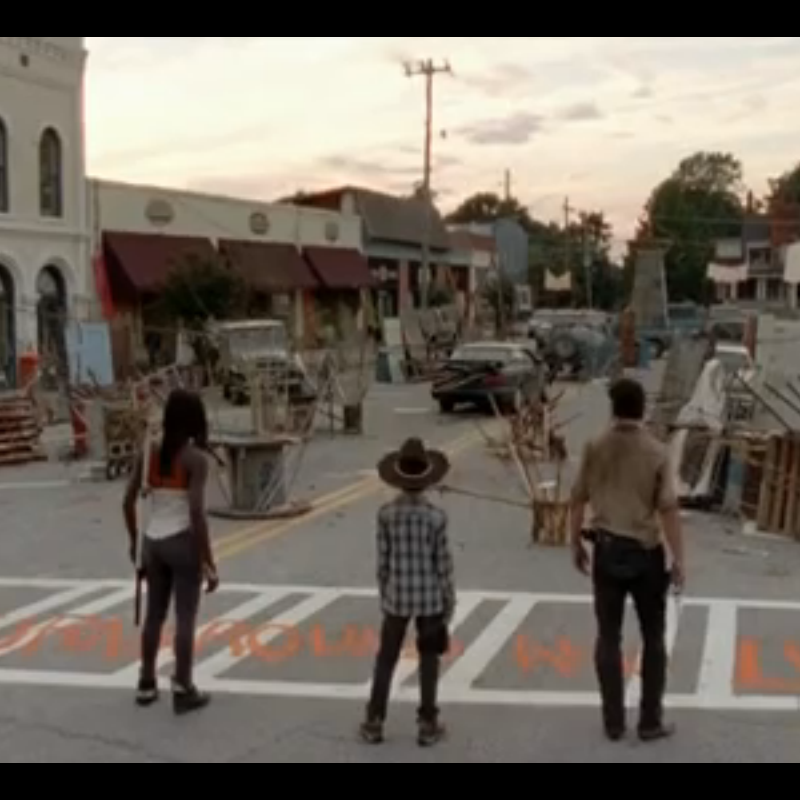 Instead, since Lori's death, Carl has softened. He cares deeply for his baby sister, has been having meaningful conversations with Carol and displayed a wisdom beyond his age when he suggested that his father give it a break. Even with the new direction, Carl has been long without any innocence or child-like qualities. When he insisted on ditching Michonne so he could go get the last remaining picture of Lori, I saw him as a child for the first time since he put on that stupid hat. His actions were that of a rash, well-meaning but dumb kid. Chandler Riggs' face as he looked at the photo made my chest all tight and again, without telling the audience, we knew that the picture was for him just as much as it was for Judith. I have a feeling that the show might be hinting at Rick's demise because of the attention being paid to his relationship with Carl. The powerful scene of Rick telling Carl how to get a car out of mud was so simple but so loaded. Andrew Lincoln and Riggs kept it understated but the implication, for me, was heartbreaking. Parents guide their children into adulthood, equipping them with as many tools as possible. Rick doesn't have the luxury of time, he needs to teach Carl as much as possible as soon as possible because, more so than in our world of aneurisms and car accidents, every moment could be the last. The scenes between Rick and Morgan and the interaction between Carl and Morgan also hinted to a Rick-less future — Carl is being prepped to survive without his parents to protect him. Rick's character has been confusing to me for a while. While he has been the most developed character and has the most traits he has still only been one-dimensional, capable of showing only one aspect of his personality at a time. There's Leader Rick, Losing It Rick, Husband Rick, Irrational Rick and Stubborn Rick. This episode gave him a chance to showcase various qualities and emotions — compassion, frustration, fear, sadness, desperation, leadership — while also building his character. We could see Rick in all his incarnations: he is a conflicted, heartbroken, kind, flawed man who only wants to protect those he cares about. Morgan, driven a bit mad by grief, will hopefully make a reappearance later. His state of mind was one that hasn't been shown on the show so far. We've seen a lot of people lose those they love the most — Amy, Sophia, Lori, the Governor's zombie daughter — but we've also seen the survivors carry on. Morgan is surviving but he has not carried on. His solitary life is an atonement for the death of his family. Next episode brings the audience back to the prison, back to Woodbury, back to the preparation for battle but I hope that the developments of Michonne, Rick and Carl stay with us. I hope that TWD maintains the emotional tension and keeps showing instead of telling. I found the decision to bring Carl along to be confusing, especially since we weren't given access to Rick's reasoning. It would be undoubtably dangerous and as we learned from Morgan, leaving a child for a moment can turn tragic. It was also cruel and bore the very likely chance of psychological trauma. I have over twenty years of memories of my parents being married but even a decade later, it pains me to look at pictures of them together. It's a physical reminder of loss and a time that has vanished. 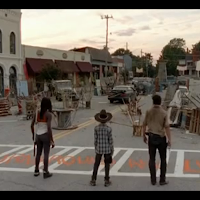 I can't imagine the reasons that Rick would have for bringing a pre-teen into the town where he grew up, where his mother had been alive and their family intact and that is now an over-grown hollow shell filled with his undead friends and neighbours. Who would be able to process that? I understand and appreciate that returning to their home was necessary to bring back Morgan but, like the decision to bring along Carl, is confusing. 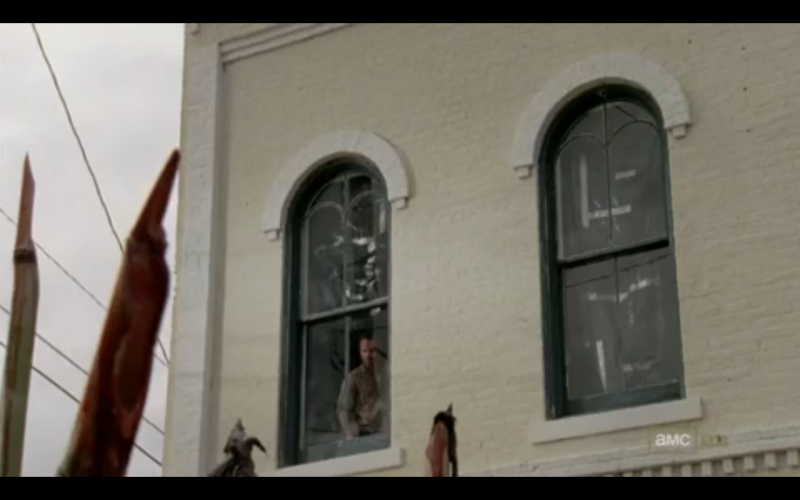 Am I not remembering correctly or did Rick not hit up his sheriff station in the premiere? Why would he think that there was any likelihood that any weapons remained at the station? And how is the town so close? Was this episode just propaganda for the NRA — if school's had weapon caches then maybe the zombie apocalypse would be more manageable? Wouldn't just raiding the thousands of cars piled up on the highways reveal a whole crap load of guns? Loved that the episode opened up with the shot of a weathered sign, complete with streamers!, alerting an Erin to her loved one's location. 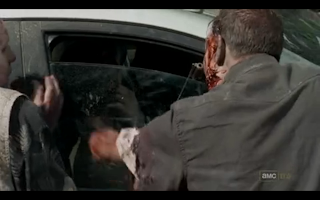 This shot alone would have sufficed because, well, Erin's chances are not great but a few minutes later one of the walkers attacking the Hyundai in a squeegee kid-esque mob is shown wearing a beaded bracelet spelling out Erin. A little cloying but, hey, they're trying! 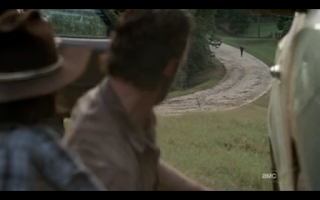 A much more satisfying sequence was Michonne and Rick ignoring the desperate hitchhiker twice. The beautiful shots of the Georgia landscape complete with lopping zombies have been my favourites of the series and to be honest I found it jarring to have that peace broken by the hitchhiker. Seeing him torn to pieces and having the Hyundai stop to grab his pack was probably the finest moment in the entire series. This is how the world is now. Morgan's Most Extreme Elimination Challenge zombie obstacle course was genius. Enjoyed that it looked like some giants were playing pick-up sticks. Also enjoyed all the allusions to how crazy Morgan must be because he has such an elaborate anti-walker system. Haters gonna hate but it works. Morgan is like the Daedulus of the apocalypse. 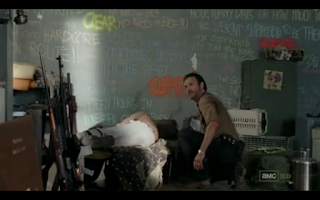 Also, Morgan's home looked like a breezy independent coffee shop with all the wall chalk and sunlight. Super cozy! Were the zombies in the restaurant turned sitting down or were they just resting their dogs? If turned like that then how? I mean, I've been to places where I've nearly starved waiting for my meal but I've never actually died (yuk yuk). 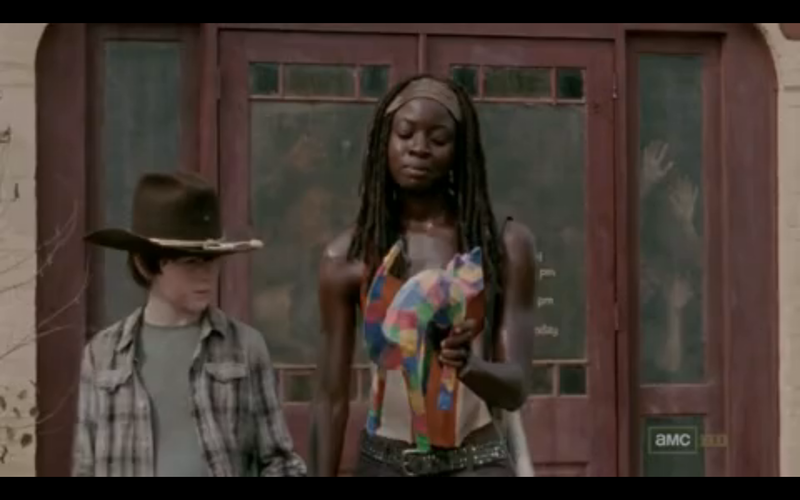 Really liked how it took Michonne all of ten seconds to retrieve the photo. She is so rad. And that Carl finally listened to an adult. Alex Snider loves a bottle episode. Her website is What Fresh Hell is This and her Twitter handle is @what_freshhell.